If you followed our TGS 2016 coverage (Day 1, Day 2 and Day 3) we used to talk about a little 'Meiji Revolution' happening right here in the gaming industry. A revolution not starting from the lower part (i.e. the market / the core gamers) but from above (the software houses and parent corporations), which is subverting the 'establishment' and, well, this year it is bringing its consequences. This year the western market – in LA represented at its best – is definitely going full o ‘cloud gaming’ (abandoning the good old package retail service) and heading forward with the full integration represented by the upcoming ‘cross gaming’ phenomenon (no exclusives for specific platforms) that, for sure, will change the way we used to play in the past for sure. And all this – we said it first - in just a year and a half! Talking about the Microsoft and Sony feud, even these days the fanboys’ war is raging on socials daily, especially after the Sony press conference, which has generated (for the non-announcement of the PlayStation 5) new flames on the historical rivalry that now, more than ever, with the launch of the new full 4K Xbox One X on November 7 is creating more than a problems for Sony. In the videogame industry here at the Tokyo Game show this is more than palpable, and at its highest levels, from management to PR, the tension is like never seen before. First of all because if you follow our ‘Made in Japan’ section, you already know that the Japanese gamers did not embrace the PS4 as we did in Europe and US, plus the high costs involved in the R&D development of new IPs on the next gen (now in most of the cases without Sony’s funds backing them. The first clear example of what we are talking about is evident from walking around the booths and checking the upcoming new titles announced for the main console of the market - the PS4 - and you see that they are at the bare bone: two from Capcom (‘Marvel vs. Capcom: Infinite’,’ Monster Hunter: World’), three for Sega (‘Hokuto ga gotoku’, ‘Phantasy Star’ and 'Valkyria: Azure Revolution'), three from Konami ('Pro Evolution Soccer 2017', 'Metal Gear Survive’ and the new Z.O.E. ), five from Square (‘Secret of Mana', 'Agents of Mayhem', ' Dissidia Final Fantasy NT’, Sudden Strike 4’') and so on. At the Sony booth there are three available for PS4 from Sony’s Internal studios: 'Gran Turismo Sport', ‘Detroit: Become Human’ & ‘Knack 2’! We are thinking that if someone coming from abroad - for the first time in Japan, and at this fair - seeing these announcements may be thinking that here the PS4 is as popular as the PS Vita in the west! Western studios instead - even if not present here with their own booths - instead still believe in Sony (even if PSVR and PS4 PRO did not sell what Sony was hoping), but still believe the risk still can pay off and that they can make a good profit. Another good example of this is with Bethesda, that even if though it is promoting here the most advertised game of the TGS ever, ‘Psycho Break 2’ (i.e. known in the west as ‘The Evil Within’), the game is not actually at the fair in Bethesda’s booth but at Square-Enix’s one instead! This is because Square is distributing the game in Japan and that’s why yesterday we said Square is focusing more on western IPs than probably producing new ones internally now. But talking about the PS Vita (as well as the 3DS) they are (sadly) almost dead here, with only Bandai-Namco still supporting them majorly at the fair by announcing two new titles (’Tamagocchi no Puchipuchi Omisecchi: Ninki no Omise Atsumemashita’, and ’Pro Yakyuu Famista Climax’). This is probably just for its massive diffusion on the market (3DS has been the best selling handheld console for many years here). PS Vita titles announced by Japanese publishers are: two from Bandai (‘Digimon Story: Cyber Sleuth Hacker’s Memory’, ‘Gintama Rumble), two from Sega (‘A Certain Magical Virtual-On’ and’ Phantasy Star Online 2’), one from Square (‘Itadaki Street Dragon Quest and Final Fantasy 30th Anniversary’), and none from Capcom. But PS Vita is not the only of Sony’s consoles in Japan to be struggling (and we've got to remember this is in its own motherland too!) as PSVR also is now showing its limits. And even though the CESA (the Japanese organiser of the TGS) has reserved an entire area for the latest VR technologies (many Asian and western companies are here these days), this new add-on doesn't seem to stimulate much interest in Japanese gamers from what we've saw and, consequentially, of the various software houses also. Apart the Harada’s ‘Summer Lesson’ (now with a sequel announced ‘Summer Lesson: Chisato Shinjo’) PSVR is still not seen as essential for the next gen gaming experience by many. We love it sincerely, but I feel like even if Konami presented the new ‘Zone Of the Enders’ with it, it will still not change much... we hope this will change, let’s see. But this TGS is not just this, what is more evident (and doubtless) for everybody coming from tomorrow (i.e. 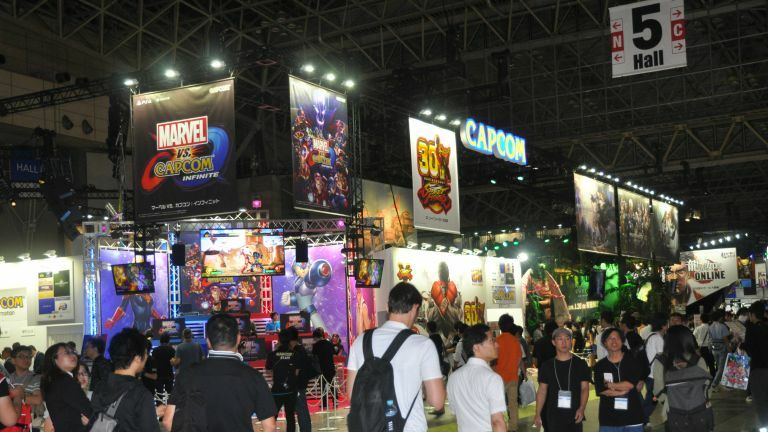 the Tokyo Game Show is open to the public only Saturday 23th September and 24th Sunday) is the really HUGE and MASSIVE invasion of the Android and iOS games' produced directly by the Japanese software houses (Sega, Capcom, Konami and so on) in quantities never seen before. Believe it or not, having lived here for a very long time, if anybody would have ever predicted a situation like this in front of an editor (in a widely known picky and 'difficult' market as the Japanese one for the international brand to be accepted, no Japanese journal would have ever given any credit to it... probably until today that is! More than 60 titles are announced or available for play. Enough said. Of course most of the international publishers are absent, but what really is once again surprising is that not only Microsoft is not here, but also giants as Electronic Arts and Level 5 . While the house of Redmond in the latest press conference has revived the interest in the west with the upcoming Xbox One X, in Japan the love was never born, so probably at the moment the base of Microsoft's marketing’s strategy is the US and western market, and only after that the Japanese market. Time will tell, but one thing is for sure, and already clear to everybody: after just a few months since the Phil Spencer's statement (Head of Microsoft's Xbox Division), which said that from now on any game for Xbox game will be playable on any PC with Windows 10, the consequences of those prophetic words has made collapse the whole market of so called "exclusives", and even the conservative Nintendo decide to join Microsoft in letting its players to cross play ‘Minecraft’ to avoid another unsuccessful port. Naturally, it will take still some years to see to this ‘Cross gaming’ at full effect, but it seems like it is where the future and the players want to go to (play every game on every system together). Last but not least: Nintendo. After a period of difficulty, paradoxically, the big N’s fast resurgence passed through not from its new consoles, but from its heyday Famicom/Nes! A success so strong to have restarted the production of a console that is 30 years old, selling so fast and well to bring back the bank account to a good level. A smart move greenlighted by the new CEO - with his banker’s experience - to give the Kyoto HQ the necessary time to recover from the Wii-U’s failure in the western market (in Japan it sold pretty well), and re-think itself and how it is going to operate over the upcoming decade. An example for all is the new ‘Fire Emblem: Heroes’ game available only for smartphones, which here is advertised so hard (even inside the subway stations!) that it leaves no doubts that Nintendo has understood that its dominance in the handheld market must shift to something “more liquid” (i.e. selling also their games on mobile phones). Pokèmon Go' s phenomenon did not bring Nintendo much money, but gave the Kyoto's HQ enough confidence and trust inside and outside the company after a period of hardware transition (especially in Japan from consoles to smartphones) focusing now its efforts from one side - more than ever (thanks even to its Nes’ success) - on its past (see the upcoming Super Famicom re-launch on the 29th of September in the west, and 5th of October in Japan), and on the other with an internal console (the Switch) to keep its fandom tight, while also trying to get new ones from the very competitive mobile gaming market. In the end: who is the real winner of TGS 2017 between Microsoft, Sony and Nintendo? iOS & Android, no doubt.